(3 p.m. EDT) -- Holland America's next new ship, Nieuw Statendam, will feature a redesigned Pinnacle suite and eight more staterooms than sister ship Koningsdam when it launches December 2018. Other spaces also have been reconfigured or enlarged. "As with every new ship, we've listened to our guest feedback and made our own assessments that have led to exciting changes to Nieuw Statendam that will enhance our stateroom experience across every category," said Orlando Ashford, president of Holland America Line. The grand Pinnacle Suite, which encompasses 1,290 square feet, has been reconfigured on Nieuw Statendam to offer an open-concept design with the living room and dining area in one expansive space. 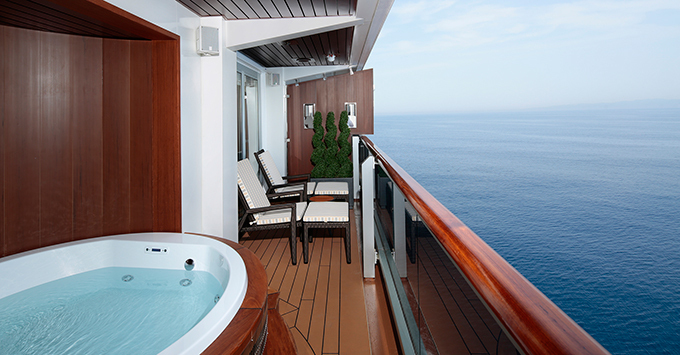 The suite also has a separate bedroom, dressing room and private balcony with whirlpool. Also reconfigured was the Neptune Lounge, a private space for suite passengers. On Nieuw Statendam the lounge has been enlarged to allow for additional seating and more windows. Nieuw Statendam will offer eight more cabins than Koningsdam, including five ocean-view and three interior rooms, bringing the total room count to 1,339. Of these, 912 will have balconies. Thirty-two ocean-view family cabins range from 222 to 231 square feet and have been reconfigured to feature more living space. Due for delivery December 1, 2018, 2,666-passenger Nieuw Statendam is under construction at Fincantieri's Marghera shipyard in Italy. Like Koningsdam -- the first ship in Holland America's Pinnacle Class -- it will feature interior design from acclaimed designer Adam D. Tihany, and popular spaces including the Music Walk.